Request 1 or more color choice and size here. 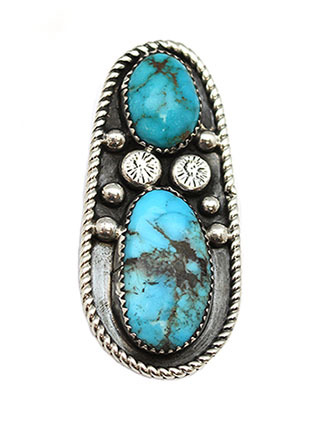 This large sterling silver ladies ring has two free form Hachita turquoise stones with stamped and plain drops, oxidized background and a twist wire border over a single wire shank. Top measures approximately 2" long by 7/8" wide at widest. It is Navajo hand made by Virgil Reeder and is a size 8. Also available in green shades of kingman turquoise in size 7 1/2 or 8 1/2. Choose color and size when ordering. Size and shape of stones will vary.